Tumwater (Wash.) High School Head Coach Sid Otton has been named the recipient of the 2006 Power of Influence Award. Otton was nominated for the award by the Washington State Football Coaches Association. The award, which is presented jointly by the American Football Coaches Association and the American Football Coaches Foundation®, will be presented to Otton at the AFCA Coach of the Year Dinner on January 10 at the 2007 AFCA Convention in San Antonio, Texas. The Power of Influence Award was created as a way for the AFCA and AFCF to honor a deserving high school football coach for his effect on his players, school and community. This award is not based on wins and losses, however, it is noted that coaches of powerful influence have longevity and success. It is the first AFCA award specifically designed to honor a high school coach. "This is an awesome honor," Otton said. "To be honored in your league or even your state is one thing, but to win a national award like this is really humbling. It is mind boggling to think about how many great high school coaches there are in this nation and for me to be recognized by the American Football Coaches Association is very special. I feel very honored." Otton has been a head football coach in Washington high schools for 39 years, and is currently in his 33rd year as the head coach at Tumwater High School in Tumwater, Wash. He has a career record of 278-113 in his first 38 years, with 16 league championships, 18 trips to the state playoffs and five state championships. With his 278 wins, Otton is Washington's all-time winningest football coach. He was inducted into the Weber State University Athletic Hall of Fame in 1993 and the Washington State Football Coaches Hall of Fame in 1996. 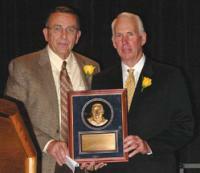 Otton has earned many awards over his distinguished career as a head coach in Washington. He was named Washington State Coach of the Year in 2006 by the National Federation of High School Associations, and also earned the Olympia, Wash., Lifetime Achievement Award in 2002. Seattle NBC affiliate King-5 named Otton "Coach Who Makes a Difference" in 2003. He earned Sportsman of the Year honors in 2001 from the Washington Interscholastic Activities Association, Champion for Kids Award in 2003 and the Rotary Club bestowed him the Paul Harris Award in 2000. Otton earned the Toyota Coach of the Year Special Award in 1987 after leading Tumwater to its first state championship under his tutelage. In 1988, Otton was one of the head coaches selected to coach in the Washington All-State High School game and earned the National High School Coaching Gold Award that same year. In a letter of recommendation, Sam Hunt, State Representative for the 22nd Legislative District in Washington, stated the following about Sid Otton's powerful influence on his players, staff and community: "Sid's influence on his staff and players is shown by their successes. Eight of his former players have gone on to play major college football and four of his assistant coaches have gone on to become successful head coaches. Former and current players and staff praise Sid for his compassion. He is a true role model and mentor to those whose lives he has touched. Sid has dedicated 39 years to the student-athletes of Washington and to the students, staff and families of our community." The other finalists for this year's award were: Tom Brown, Maiden H.S. (Maiden, N.C.); Don Lessner, Mason H.S. (Erie, Mich.); Mike Mahlen, Verndale H.S. (Wadena, Minn.); Frank McClellan, Barton H.S. (Barton, Ark. ); Jerry Miller, Montrose H.S. (Montrose, S.D. ); Phil Ottney, Glenwood H.S. (Glenwood, Wis.); Hugh Sandifer, Wylie H.S. (Abilene, Tex. ); Rollins Stallworth, Proctor R. Hug H.S. (Reno, Nev.); Brent Steuerwald, Shenendehowa H.S. (Clifton Park, N.Y.); Perry Thomas, Tilghman H.S. (Paducah, Ky.). Past Power of Influence Award recipient's include: Larry Dippel, Amarillo (Texas) H.S. (2002); John McKissick, Summerville (S.C.) H.S. (2003); Marcus Borden, East Brunswick (N.J.) H.S. (2004); and Ron Stolski, Brainerd (Minn.) H.S. (2005).